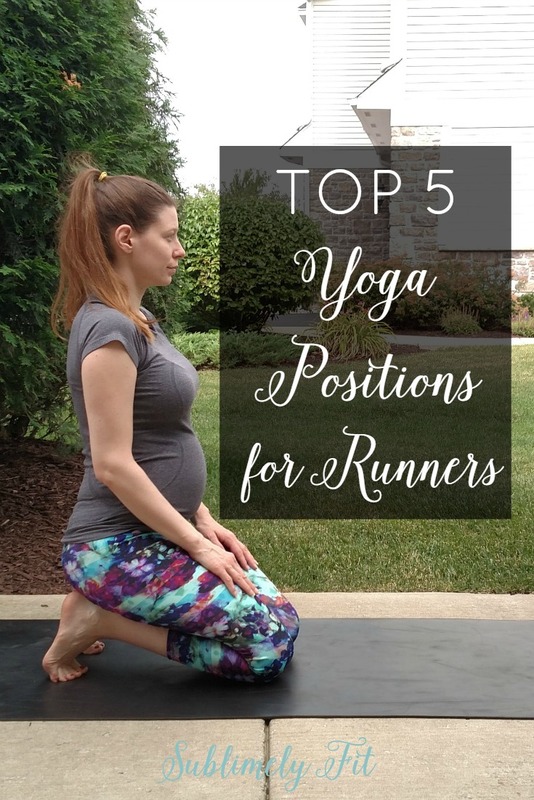 As a yoga teacher and running coach, one of the questions I often get asked is what my top yoga positions for runners are. It’s hard to whittle down a lot of amazing poses down to just a few. But, today I wanted to share five of my favorite yoga positions for runners that just about any runner can do. These are yoga poses that I would recommend any runner try (assuming you’re not injured) because they’re relatively easy to modify if you’re very tight. DISCLAIMER: I am a yoga teacher, but I’m not your yoga teacher. Ask your yoga teacher or medical professional for specific modifications for any injuries you might have. Remember, if anything hurts, don’t do the pose. One of my very top yoga positions for runners is Downward Facing Dog. Down Dog is great for helping to stretch out the legs, particularly the calves and ankles. It will also help you build up strength in your upper body, which will help you keep good running form as you run. If you’re just building up to Down Dog, you can start by placing your hands on a chair or blocks. This will help shift more of your weight to your legs as you build up upper body strength. Be sure to keep your feet hip-width apart (usually two fists’ distance) and your hands shoulder width apart to keep your joints in proper alignment. Pyramid Pose is one of my very favorite yoga positions for runners to help open the hamstrings, and it might just be my most favorite hamstring stretch. However, it can be a very intense stretch, and is often too intense for runners who have very tight hamstrings and hips. That’s why I love to encourage my students to use blocks in this pose. 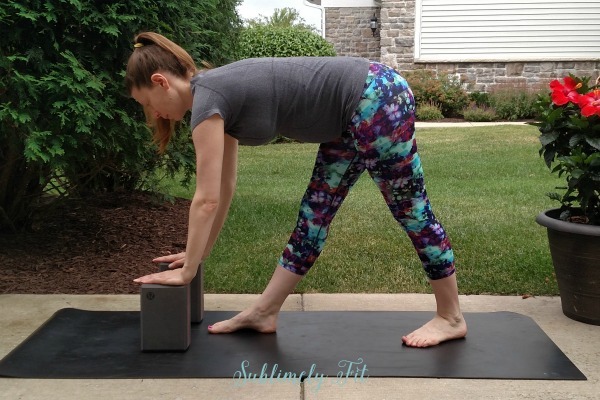 Using yoga blocks will help you bring the ground closer to you. That, in turn, makes it easier to find a good stretch without overstretching. If you’ve been reading my blog or following me on social media for a while, you know that Reclined Pigeon Pose is my favorite hip opener for runners. That’s because it’s very easy to modify the amount of stretch you’re getting in Reclined Pigeon. You simply pull a little more strongly to intensify the stretch, or release more if you need a milder stretch. If you’re pushing too hard in a stretch, your body locks up and you don’t get anywhere. Reclined Pigeon Pose will help you find just the right amount of stretch so that you can really make progress openin your hips. It’s very important for runners to build core strength, which is why Dolphin Plank makes my top 5 yoga positions for runners list. Unlike standard straight arm plank, Dolphin Plank gives your wrists a break. That’s essential if you’re like me and you have bad wrists. Dolphin Plank is also easy to modify if you’re building strength. You can easily come down to your knees as you hold your plank. It’s very common for runners to neglect their feet, but it’s so important that you do take care of them. After all, your feet are the first part of your body to hit the ground as you run, and they do take a pounding. This pose is wonderful for stretching out the plantar fascia on the bottom of the feet, which gives many runners a lot of trouble. Toe Squat can be modified by placing a folded blanket or pillow under your knees. That extra support will help take some of the pressure off of your feet. If you have bad knees, you can also modify by placing a blanket between your thighs and calves. Increasing the space between your thigh and calf will help take some of the pressure off your knees. Ready to learn more about yoga positions for runners? or get more information about my Yoga for Runners Online Program! Especially toe squad for my feets! Right? I have super tight plantar fascia and that pose hurts so good. I really should do it even more often! Also cow faced pose. Love that. Great poses, Beth, and I love the baby bump!